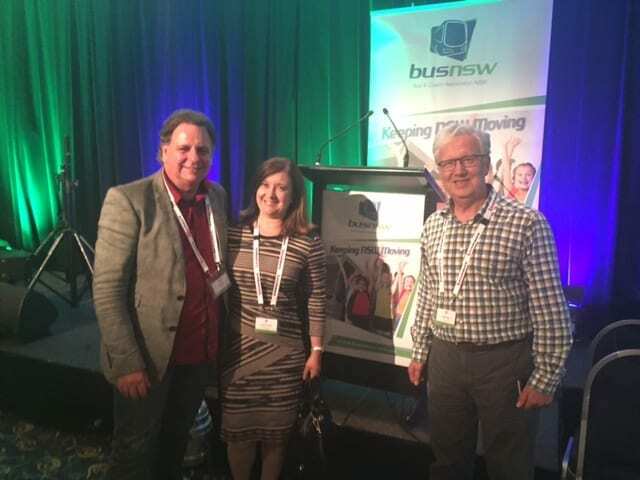 Chris Hall and Venetta Sacha attended the 2016 BusNSW Member Annual conference in Wollongong. The conference provided to more than 200 bus operators, government representatives and industry suppliers the opportunity to expand their knowledge on current issues and changes happening to the industry. Our clients John King and Gerard King were actively involved in discussions with many other operators on the effect of these changes to their government contracts and KPIs. John King from Premier Motor Services could not be more proud with the excellent on-time-running KPIs of his bus company in Wollongong and meeting his other contract requirements. Focused on systems and delivery of great customer satisfaction, John has built a strong management team and is running bus and coach services with over 400 buses and coaches from 14 depots. He passionately contributed from the interactive industry panel his view on the operators’ key issues for the next 3 years. The answer is that there are no certainties in life – sorry about that. But, this doesn’t mean that you can’t take charge and protect against uncertainty – you just need to know where and how to look at it. The reforms to social welfare in the last few Federal Budgets didn’t quite make it through the Senate in full. But, times have changed and Palmer United is no longer the Senate ‘king pin’ it once was – directing traffic on Government policy and social reform. Many of the ‘dramatic’ changes that impact on mature business models – online retail vs traditional retailers, the shift from paper publishing to online publishing, the demise of packaged electronic products on shelves to download delivery, or for example, the impact of Uber on taxi services – were reasonably predictable. There were recognisable indicators for each of these changes well before they had a direct impact on Australian businesses. Online retailing existed decades before denting bricks and mortar retail sales in any recognisable way, and as soon as faster internet speeds enabled quicker downloads the packaging and B2B sale of most electronic products became unnecessary. Tech company Uber started in 2009, spreading exponentially around the world well before it launched in Australia in 2014. If anything, Uber proves that the foundation of any industry can be shaken dramatically in less than a few years. In many cases, these ‘disruptive’ businesses offered something to consumers not reliably fulfilled by the existing market – efficiency, access, range, and importantly, greater consumer control not just acceptance of what is on offer. Tax relief for restructures – changes to be introduced this year should allow small business to change their business structure without the risk of triggering CGT and other income tax implications. So, it is a good time to check whether your structure is right for your long-term business plans. The social security income test tightened on 1 January 2016 for superannuants. If you receive defined benefit income from your superannuation, a larger portion of this income will now be taken into account when applying the relevant social security income tests – capping the proportion of income that can be excluded at 10%. This affects aged care fees, income support payments, the Low Income Health Care Card, etc. Having a clear and planned exit strategy in place is a big part of making sure your future is protected. This doesn’t just include being prepared in the event of death, sickness or divorce but also in selling your business. Many clients know that one of my passions in life is skiing. I have even been fortunate to have skied with some clients in beautiful places around the world. Recently I was lucky to spend a few days skiing in Thredbo with family including my two young grandsons. The grandsons are still at an age where they think their grandfather is a cool dude skier (how long will that last?). Anybody who skis in Australia knows that that in the run-up to the trip there is time spent searching weather websites to see if we will be blessed with snow and great skiing conditions or the dreaded rain, wind and the resultant icy skiing. We had great skiing conditions which made the skiing easy. Not every skiing trip has been with such great skiing conditions. 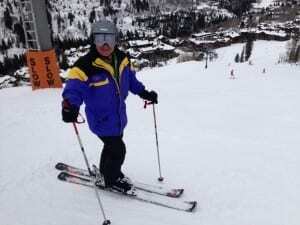 Since returning from the trip I have been reflecting on the similarities between skiing and business. Like skiing, business is easy when conditions are good – all that is needed is a bit of drive, the right gear and the all important cash flow. Once the conditions deteriorate we need abilities, resilience and strengths not called on in the good times. At these times it is still enjoyable to ski if family or friends are there to support and guide each other. Not all skiers, or business people, have the skills and planning to survive. During difficulties good relationships, both personal and business, are important to support each other. It is easy to have a good relationship when everything is rosy. A great relationship is tested and proved by the difficult times. At Hall Consulting Group we have been in business for many years and we have witnessed every possible challenge of the ups and downs of business. It is during the down times that we provide the strength of our knowledge and experience to support and advise clients through difficult times. Just like skiing business can be rewarding and enjoyable if you are skiing with the right team!